When decorating your rural home it’s important to come up with interior design ideas that will highlight the gorgeous rustic features that make your house a home. Rather than choosing statement interiors that take away the traditional character, you need a middle ground that offers fashion-forward design whilst maintaining the inviting allure of a little house in the country. Our humble Plaid wallpaper wraps any room in a warm embrace. The perfect way to decorate your country home is to play upon its natural cosy feel and this gorgeous textured wallpaper does just that. With soft neutral tones, this touch of tartan gives your walls a subtle blush of colour and when paired with our stunning Stiff Upper Lip paint (as seen above), you can create a charming interior that welcomes your guests with open arms. 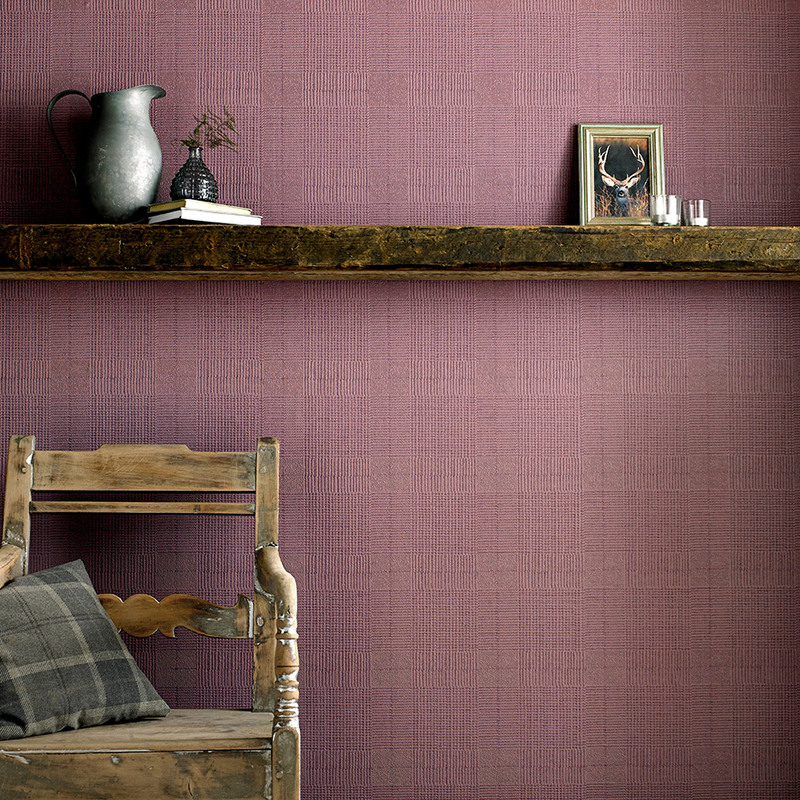 Our unique Tweed wallpaper offers a similar effect in a typically British way. Coming in a range of colours, we’ve chosen to highlight the velvety cream hue of our Soft Grey Tweed design. An unexpected wash of deep purple, this wallpaper adds a little twist to your interior without taking too much focus away from the traditional feel of your country home. Evoking a cosy sense once again, it’s the distinct texture that gives you and your guests that warming feeling of home as soon as you step in the room. Working with textures is a fantastic way to reclaim the traditional, stripped back sense in country homes. Getting back to your roots with earthy elements and rough textures makes your home blend into the gorgeous country surroundings. 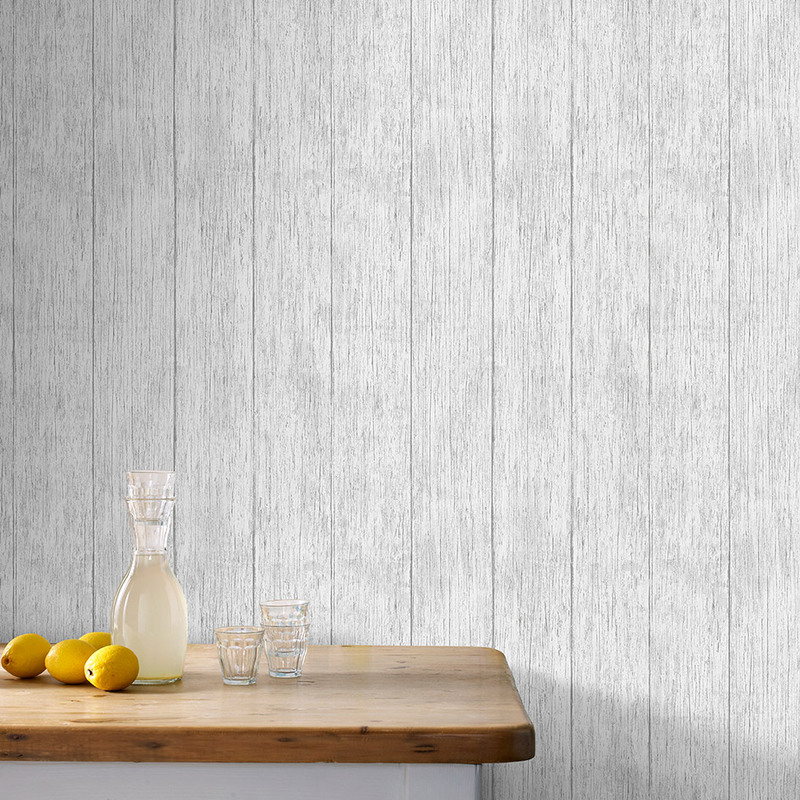 Take our New Brick Grey wallpaper for example. The changing shades of grey give off the sense that your walls really are lined with stone cladding. Meticulously-lined tiles would of course give your home that touch of mother nature, but our stunning wallpaper offers exactly the same look with much less effort and cost! Aligned up against our Clooney paint by Laurence Llewelyn-Bowen this rustic wallpaper brings a down-to-earth feel to your country kitchen. For a lighter touch of texture for your walls, our Sahara Natural wallpaper offers a wooden backdrop that makes your room feel like a fresh, homely sanctuary just for you to enjoy. A simple texture that adds chic interior design to bathrooms and staircases, its extra washable surface also ensures any marks can be easily wiped away. Mixing textures such as wood and metal makes for an interesting rustic combination. 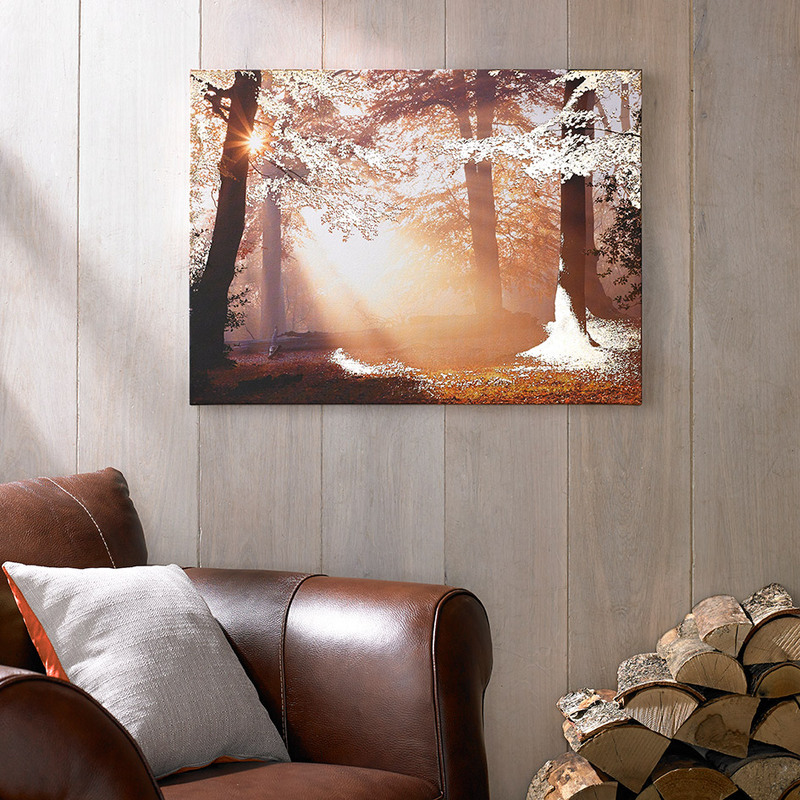 Our metal wall art collection would be the perfect addition to wood-effect walls or original wooden beams. As you can see in our image above, the contrasting textures between the wooden-look wall and our Ornate Ethnic Panel create a stunning effect. Unexpected but not too overpowering, the clash of textures makes a statement without redefining your home. Little wall art additions can really make an impact in a rural home. A window to another world, these little hints of glamour bring luxury to a humble home and give it a special finish. Metallic wall art often evokes a particular sense of sophistication for rural homes as there’s just a hint of indulgence that doesn’t upset the balance in your countryside home. Take our Metallic Forest wall art for example, an enchanting setting that adds whimsy to any room, delicately adorned with just a touch of glittering wonder. It’s a fine balance, but by experimenting with textures in your home, rather than bright bold prints you can create a beautifully decorated rural house that retains its traditional charm.